Earl Doherty and Richard Carrier have suggested that there is an ancient text outside the Bible that stands as direct evidence for some early Christians believing that Jesus Christ was crucified by demons in a celestial realm. That text is The Ascension of Isaiah (AOI), believed to be a composite document whose earliest parts were quite likely authored as early as the late first century. Scholarly work on AoI has been on the move. 1995 saw two pivotal Italian works that have paved the way for a new consensus. Enrico Norelli has been a key player in this research. I don’t have access to those but yesterday a copy of Norelli’s 1993 Ascension du prophète Isaïe arrived in the mail. I have only struggled through chapter 2 with my very rusty French so far but it is already clear that the old views are being challenged. The work is not nearly so fragmented as earlier studies have believed. Both the first part, chapters 1 to 5, depicting the martyrdom of Isaiah, and the second part, chapters 6 to 11, portraying Isaiah’s vision of the descent of the Christ figure (the Beloved) down through the seven heavens to be crucified, harrow hell and return to sit beside God again, are Christian works. The Christian sect responsible for the AoI (all of it) was exalted revelations through visions and saw themselves competing with rival sects, each blaming and persecuting the other as false prophets. The account of the birth of the Beloved to Mary in Bethlehem is not a late addition but was original to the vision chapters (6-11). That means The Beloved did indeed descend to earth and was crucified on earth — unrecognized by the demons. The details of the nativity scene draw on a source also known to the evangelist responsible for the Gospel of Matthew. The AoI does not know the canonical gospel but both are using a common source. The two nativity versions — Matthew’s and the AoI’s — represent competing theologies. That is, the AoI was (and several reasons are given for this conclusion) written around the same time or environment that produced the Gospel of Matthew. The reason for the Beloved appearing to be flesh and dying was to save humanity by means of conquering their demonic rulers. To me this is fairly mind-blowing stuff if true. We would need to account for a view of the “gospel” that stood in stark contrast to all the assumptions and “traditions” behind Matthew appearing on the scene at around the same time. That question alone poses enormous questions for the traditional view of gospel origins, surely. Further, if we accept Norelli’s revisions to our understanding of the AoI then it would appear that the AoI might support in part Roger Parvus’s interpretation of the original (“mythicist”) gospel: that Jesus descended to earth to be crucified before ascending again. Except that Roger, I think, argued for Christ only appearing for a short time on earth for this purpose. The AoI has the Beloved hiding his identity from the demons by means of slipping into the world through Mary. Okay, my head is still spinning. Keep in mind that the above is my impression as discerned through some very fuzzy memories of my French. I would like to roughly paraphrase (not translate!) the different sections of chapter 2 to share with others here over the coming weeks. P.S. If anyone capable is interested in translating the chapter let me know in case I am able to forward a copy of the chapter. Posted on 2015-01-08 11:07:45 GMT+0000 by Neil Godfrey. This entry was posted in Biblical Studies and tagged Ascension of Isaiah, Gospel of Matthew, Norelli: Ascension d’Isaie. Bookmark the permalink. Has a date range of composition been proposed or is he just saying contemporaneous with Matthew whenever that was composed? If Norelli is right, does this undercut a lot of the support AoI is supposed to give for Doherty/Carrier-style mythicism? They of course have a lot of evidence other than AoI but would AoI in any case be taken out of the mix, since it would no longer seem to be a case of an early Christian text showing Christ existing solely celestially? If you take AoI out of the mix, you have no good, tangible evidence that a celestial-Christ-only sect existed. Docetism cannot be roped in, because its logic is not that Christ didn’t come to Earth, but that he wasn’t the human he *appeared to be* while on Earth. I wouldn’t say AoI itself is tangible evidence that a celestial-Christ-only sect existed. The two extant versions of Chapter 11 are completely different (the terse S/L2 and the verbose E/L1) but they both say in so many words that Christ lived on earth, and they both strongly imply docetism. The terse version states “he dwelt with men in the world”. You are completely right that docetism is not a “celestial-Christ-only sect”. Note that docetism is compatible with Parvus’ take on the Ascension of Isaiah, since unlike Carrier and Doherty, Parvus argues that AoI is docetist originally: it originally described the Christ killed in human form while on a brief visit to earth. Indeed, the terse version of chapter 11 does not contradict Parvus, although he believes there was once a much longer version that is no longer extant. What I meant is that AoI can be construed as tangible evidence for the celestial Christ theory *if* one accepts the Carrier/Doherty approach to the verses about dwelling on Earth (and, for that matter, the nativity story). Very interesting. I don’t think that proving Jesus never existed depends on proving that the earliest form of Christ worship espoused a celestial crucifixion, but a celestial crucifixion sure makes the case easier to make. Still I think Jesus is different from Isaiah in this regard. Because the role of Isaiah was to confront the followers of Beliar, but the role of Jesus was to destroy the material world and create a new immaterial world in heaven. This means that the task of Isaiah had to be done on earth, where the followers of Beliar were, but the task of Jesus is different. The task of Jesus is to destroy the material world. Thus, there are reasons that Isaiah would have come to earth that are different than the motives for the actions of Jesus. My view of the early Jesus is EITHER that the early Jesus could never have been imagines to be material or to have come to earth, because Jesus was to be a superior immaterial messiah who was uncorrupted by the evil material world, OR Jesus had to have come to earth and become material and have his material flesh destroyed mirroring his destruction of the material world. In other words, as far as the early theology goes I can see how Jesus become material could make sense, if his becoming material, being killed, and then being raised immaterial was supposed to mirror his task of killing the material world and raising a new immaterial world. But one could also argue that the task of creating a perfect immaterial world could only be taken on by a messiah who had never been corrupted by becoming flesh himself. Either way, however, we are still dealing with myth, and I don’t think anyone would argue that the Isaiah of the Ascension narrative was a real person. Indeed I would say that the case for Isaiah having ventured to earth via Mary being original further boosts mysticism, because it provides a model for an earthly mythical Jesus. The problem now is that we’ve somewhat staked the mythicist position on the idea that the first conception of Jesus was that he was totally heavenly and never ventured to earth. What this interpretation of AOI does is provide a model for an earthly mythical savior. As for the question of dating, I can only say at this stage that Norelli places the AoI distinctly earlier than many of the concepts that we see from early or mid-second century on. As for the question of mythicism, while the Doherty-Carrier view has become the most well-publicized view it has never been the only (nor always the most “popular”) Christ Myth hypothesis. The argument for it is indeed strong and stands quite apart from the AoI. Only those who have never read Doherty or Carrier but only the works of critics who likewise have only skimmed their works and constructed straw-man versions of their theses would think removing the AoI undercuts their arguments. I’ll comment further as I take more time to post paraphrases of chapter 2 here. Interesting. Of course, this would certainly cause the Roman authorities to classify the whole lot as a dangerous and lethal superstition ( exitiablilis superstitio and outlaw it. Well no historical character I know of ever had a magic birth! How can this jive with the Marcan gospel explicitly claiming that the demons did, in fact, recognize Jesus? (Mk 1:23-24, etc.). Awkwardly. Looks like Mark has transferred the ignorance motif from the demons to the humans. Fascinating article by George T. Zervos (UNC), referencing Norelli, comparing/contrasting AOI to Matthew, and proposing a source (Genesis Marias) common to AOI and Protevangelium of James for the Marian material. Have We Found the Missing Link? It is no exaggeration to say that study of the Ascension of Isaiah has been revolutionized by the work of the research team of Italian scholars brought together by Mauro Pesce in 1978. The major fruit of their work is the two volumes of texts and commentary, published as volumes 7 and 8 of the Corpus Christianorum Series Apocryphorum in 1995. I The first of these volumes contains new editions of all the texts and versions of the work or parts of it (Ethiopic, Greek, Coptic, Latin, Old Slavonic), together with a synopsis in Latin, so that the student of this work at last has relatively easy access to all the complex textual evidence for it. The second volume, which is entirely the work of Enrico Norelli, is a 600-page introduction and commentary. The scope and thoroughness of Norelli’s work on the Ascension of Isaiah are such that even this large volume could not do it full justice, and so he has also published a substantial volume of essays, which supplement the commentary and can be used as a companion volume to it. Norelli’s work constitutes the most important study of the Ascension of Isaiah to date, and in many respects is likely to prove definitive. But it is not the only significant work to come out of Italy. In addition to several significant articles by members of the group, three further books have appeared. At a conference in Rome in 1981, members of the group were joined by several other Italian scholars, and a volume of ten papers from the conference was published. Antonio Acerbi, who was associated with the group without participating directly in the edition, has published two books, one tracing the transmission history of the Ascension of Isaiah from the second to the sixteenth century, the other a study of the content and composition of the work. All this material has brought the study of the Ascension of Isaiah by leaps and bounds into a completely new era of study. It is extremely unfortunate that accounts of the Ascension of Isaiah in the major reference works published in recent years have been written in ignorance of it, and for the most part merely perpetuate the views of the scholars who worked at the beginning of the century (especially R. H. Charles and E. Tisserant). But significant contributions have also been made in recent years by two English speaking scholars working largely independently of the work of the Italians: Robert G. Hall and Jonathan M. Knight. Chapter 5 is a major discussion of the relationship between the Gospel traditions in the Ascension of Isaiah and the Gospel of Matthew, in which Norelli argues, rightly in my view, that the Ascension of Isaiah is not dependent on Matthew. The close relationship between its Gospel traditions and some of Matthew’s special material reflects not literary dependence but common use of the same traditions. Clearly this conclusion makes the Ascension of Isaiah a very significant work for the study of Matthew and his sources. A study of the christological titles in the Ascension of Isaiah (chapter 14) breaks new ground in the understanding of the work’s distinctive Christology. It shows how the christological titles correspond to three levels of knowledge of Christ: earthly knowledge, such as the Gospel traditions provide, higher knowledge such as Isaiah gains in his ascent through the first five heavens and which the distinctive christological title ‘the Beloved’ represents, and the knowledge of Christ as Lord, sharing God’s heavenly sovereignty and glory already in his pre-existence, which can only be revealed in the sort of visionary experience of ascent to the highest heaven which is granted to Isaiah. In this christology scriptural exegesis (especially of Isaiah) and visionary experience (such as occurred, Norelli thinks, in the prophetic circle from which the Ascension of Isaiah comes) combine to reveal the heavenly Christ as the eternal Lord of the cosmos. I’ve commented on Norelli’s conclusion that the AoI drew upon a tradition also known to Matthew; Bauckham’s second point points to one of the features that early Christianity shared with other mystery religions. No doubt. For instance, I’m reminded of Merkabah mysticism and the divine throne theme also found in AoI, along with singing praises. Yes, and interestingly, Zervos does bring into discussion ideas of Bauckham, Knight, and Hall. 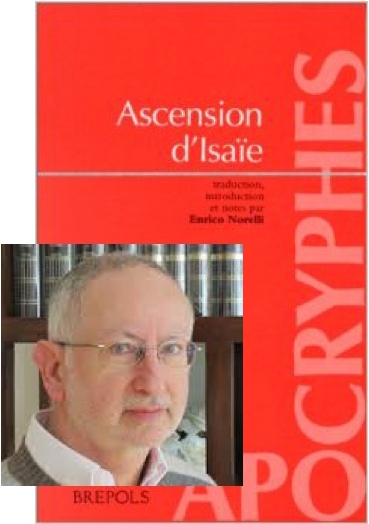 I have a copy of Norelli’s Ascension d’Isaïe and I consulted it when I wrote parts 7 through 9 of my blog series on a Simonian origin for Christianity. In part 7 of the series I noted in passing that Norelli put the date of composition for the Vision of Isaiah at the end of the first century. And in post 8, as part of my Jan. 30, 2014 response to George Hall, I quoted from page 52-53 of Norelli’s book. However, just judging from this one book of Norelli’s, I’m skeptical that his work will prove to be, as Bauckham says, “definitive.” And I don’t see that Bauckham himself really considers it all that definitive either for, as I recall, Bauckham argues that Norelli is wrong about assigning a different author to each of the two parts of the AoI and about Norelli’s dating of the second part (the Vision of Isaiah) earlier than the first (chapters 1-5). I think that AoI has marcionite influence and then it’s later middle II CE. The only reason for a mythical heartly Jesus is hate of world as creation of Demiurg. The author of AoI, if I follow Norelli’s reconstruction of original text, is a JudeoChristian from the same sect of Revelation (in Revelation there is a woman and a birth, too) with the intention to identify the Demiurg with Satan and not with the God of Jews (against Marcion). It would be interesting to know the Roger’s view on this aspect. What evidence is there that “light metaphors, the angels, and the glory and brightness of the Risen” are angelic elements that are distinctively Marcionite? And even assuming they were, I don’t see any reference to “light” or “glory” or “brightness” in 3: 13-18 of the AoI. What translation are you using? There are angels in the passage, but I am not aware that “Michael, the chief of the holy angels” (AoI 3:16) was any kind of a favorite with Marcion. Do you know of some particular patristic passage that says Michael had a role in Marcion’s gospel? To me, the passage looks Jewish Christian, not Marcionite. excuse me, Roger, I have not explained well my view. I think that all these elements (…“light metaphors, the angels, and the glory and brightness of the Risen”…) show a marcionite influence on a Jewish Christian sect basically hostile to Marcion – and then a sect who writes basically in reaction, but under influence too, against Marcion. Obviously it’s only a possibility. But if Norelli is right on the presence of birth in AoI (and I don’t know if he is), I can only imagine that AoI was written after Marcion and before GMatthew. A birth is necessary for the Son only for who polemizes against Marcion. A question: in Jewish-Christian Revelation (last I CE) there is a woman, too, and a birth. It’s all allegorical? Or is it an element of original myth of Pillars? My guess would be that the woman is allegorical. Revelation was written by a prophet who saw himself as belonging to some kind of band of “brother prophets” (Rev. 22:9). The woman is perhaps an allegorical stand-in for that prophetic movement that gave birth to Christianity. Through them the existence and entrance into the world of the “son … who will rule all the nations with an iron rod” (Rev. 12:5) was made known. In that sense they gave birth to him. That birth brings them to the attention of the Dragon and he pursues them. There is, by the way, some resemblance between this and the AoI. There we again have a band of prophets who are distinct from the rest of the believers. And Beliar gets “very angry with Isaiah because of the vision… that through him there had been revealed the coming of the Beloved from the seventh heaven, and his transformation, and his descent, and the form into which he must be transformed, (namely) the form of a man…” (AoI 3:13). Michael, defined in the Book of Daniel, is totally incompatible with Marcion, whose Jesus is explicitly not the messiah of Daniel. Of course, the point made here: “to save humanity by means of conquering their demonic rulers” shows that the group associated with this part (or all) of Ascension of Isaiah were still working from the same ideas as Gnostics. There’s also the point that it used material in common with Matthew without quoting or using Matthew. 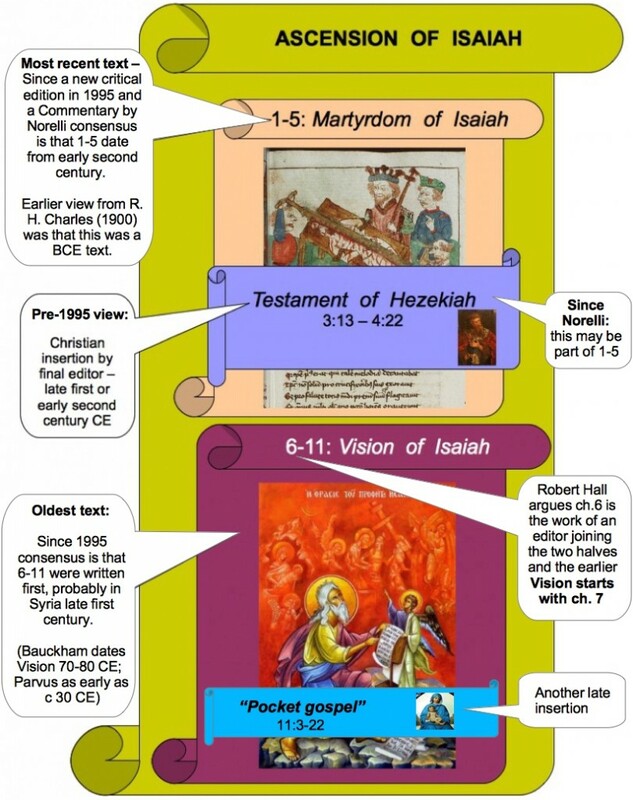 Here’s a suggestion…might The Ascension of Isaiah have been closer to the Gospel of the Hebrews? And perhaps more so than the Irenaean version of Matthew? By the way, Neil, have you done any more research on Hegessipus? I remember from last year you were going to be doing a post on that. I’m still intrigued at the fact there was someone going around in the mid-second century trying to style himself a Christian Josephus and I’m curious as to how much of real Josephus he used. Would we consider such a Pseudo-Josephus a forger? And what sort of impact would he have had on the churches or early fathers of the mid-second century? Then again, I’m aways wondering why Josephus was chosen by Christians of the earliest centuries to use for reference instead of the other noted historian, Justus, secretary of Agrippa II…though the early chapters of Acts seems to answer that in an oblique way. No I haven’t, George. Too many other interesting things keep Hegessipus a few points down on my priority list. The text insists that Jesus really died, leaving open to question the manner of his earthly appearance but insisting nonetheless that the humanity is real. The Christology is, if anything, more obviously anti-docetic than docetic in terms of what is said about the passion in 3.13, 18 and 11.19-20. In the wake of the present study, it emerges that the authors stand much closer to Ignatius than has been realized. And if the Ascension of Isaiah (like Revelation, too) was only one of first various Judeo-christian attempts of response and reaction against the gnostic first introduction of Messiah’s death? 1) 70-90 CE: some Jew preachers/Spirit-possessed predicted the imminent future arrival of Messiah ‘Joshua’ (Didache, Enochic leterature) meaning generic ‘salvation’. 2) 90-110 CE: the first Gnostics among them (Simon Magus? Cerinthus?) invented the idea of a (only apparent) Messiah Jesus dying by hand of ‘Jews’ on earth and ascending up to heaven. 3) 110-120 CE: the same Jews of point 1, instead of rejecting the entire concept of Messiah’s death on earth as basically alien to their beliefs, incorporated it into Jewish sacrificial system (Revelation, Hebrews, Barnabas, Odes of Solomon, Ascension of Isaiah…) and linking that death to fall of Temple. 4) 120-140 CE: The Marcionites attempted to armonize Jews and Gnostics with their fictitious leterature (”Paul”) and their Earliest Gospel. 5) 140-200 CE: But the proto-orthodox Judaizers prevailed after splitting Mcn in our four canonical Gospels. I believe that, only if you reject a priori as mere apologetical armonization any scholar suggestion about a presumed basically Jewishness of concept of a dying messiah, then the only possible conclusion is that above. Maybe after Jesus was killed on a “tree” its curse was removed among his followers by reflection on e.g. Isaiah 53.3 and Daniel 9.26. The gospel “chronology” seems to be fitted into the prophecy in Daniel. So you would say there has long been a general divide between European and “English speaking”(?) scholarship on the AoI or is that reading too much into your comment? P.S. I like the diagram. Not possible for the original to have included 11:2-22. The demons lay their hands on the beloved in the firmament, so he cannot be an unknown crucified in Jerusalem. My feeling is that the original Vision included ii cor. 2:9, which Paul quotes as scripture, and that the Pauline citation “and he ascended on the third day, according to the scriptures” (i cor 15) are from the Vision, which was regarded as genuinely Isaiahan by a protochristian group. (“the mystery kept secret for long ages” etc.) The solitary possibility for a scriptural quote mentioning resurrection on the third day otherwise comes from a single verse in Hosea, which is about revival, not resurrection or ascension and uses the first person plural so could not be understood to refer to a solitary person with heavenly origins. I agree with Roger Parvus that L2 reflects the original, for a close reading of Charles demonstrates its more primitive, less embellished character. I’ll be posting again on AoI soon. Will look at some of these basics through Norelli’s eyes.